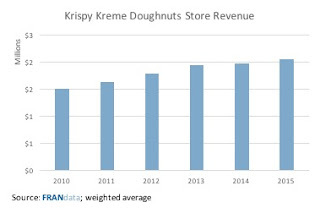 Last year, Germany’s Reimann bought U.S.-based Krispy Kreme Doughnuts, an 80-year-old franchise. Now they company announced its move into Nigeria, the continent’s most populous country. This follows Krispy’s first African venture into South Africa in 2015. Worldwide, the brand operates over 1,100 locations. It seems, the Germans made a wise decision. 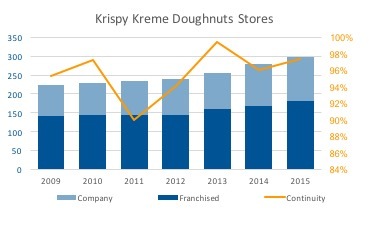 In its domestic market, Krispy Kreme grew at a CAGR of 5% between 2009 and 2015. The company locations grew at a faster CAGR of 6% over the same period. The franchised store continuity rate was an average 96% each year pointing towards sustainable and stable growth. In addition, average store revenues increased at a CAGR of 6% to over $2 million between 2010 and 2015. Now that the ultimate owner is German, there is hope for consumers in the country. So far, Krispy Kreme only operates locations on U.S. military bases.